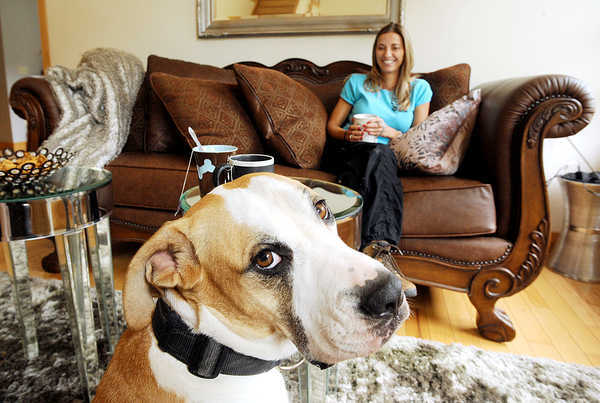 Mason is one of Lisa Nazarenko's four trained dogs that she uses to track lost cats and dogs. Mason is a boxer-hound mix. Lisa Nazarenko of Bowdoin has formed Lost Pet Tracking Dogs, a business that specializes in finding missing dogs and cats. Dante, one of Nazarenko's four trained dogs that she uses to track lost pets, is pictured with Nazarenko. Dante is a scent-specific K-9 that Lisa Nazarenko has trained to help locate lost pets. BOWDOIN, Maine — Lisa Nazarenko is, she believes, the state’s only pet detective. And, so far, she and her highly trained four-dog team have been a rousing success. Nazarenko’s decision to become a pet tracker started last year with her own lost yellow Lab, 12-year-old Cappuccino. For two months she conducted a massive search, putting ads in local papers, buying banners for turnpike ramps, and offering her 2007 Buell motorcycle, valued at $13,000, as a reward. She hired a professional dog tracker from Maryland — the closest to Maine she could find — and begged the woman to come back time after time to search the deep woods around her home. But no matter what Nazarenko did, it seemed, she couldn’t locate Cappuccino. She felt helpless, and she didn’t want any other pet owner to have to feel that way. She would find her beloved dog, she vowed. And once she did, she would help other Mainers find their animals, too. It’s a vow she has kept. This summer, a year after volunteer searchers found Cappuccino’s body less than a mile from her Bowdoin home, Nazarenko formed Lost Pet Tracking Dogs. She spends part of her day as a cardiac nurse at Central Maine Medical Center in Lewiston. She spends the other part of her day with black Lab Bella, Belgian malinois Dante, bloodhound Vita and boxer-hound mix Mason, scouring woods, mountains and rocky terrain in search of missing cats and dogs. 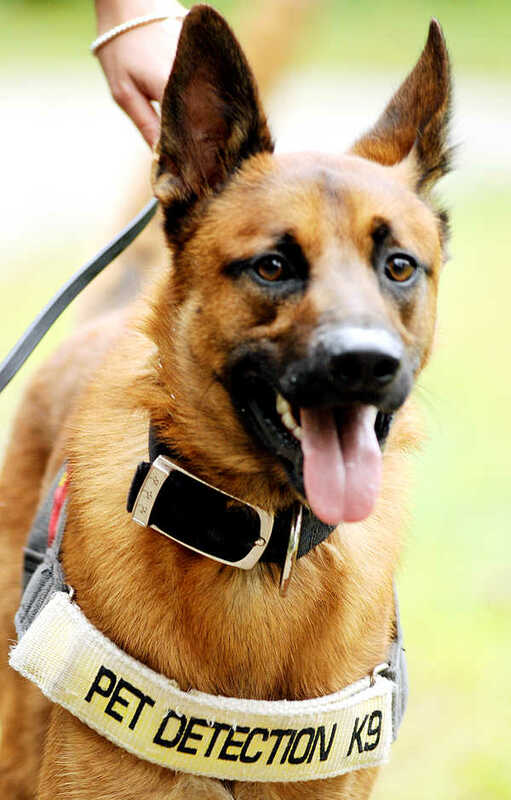 Nazarenko trained for six months with a professional dog tracker from Nebraska. She immediately began working with Bella and Dante as puppies. She adopted and trained Vita after the bloodhound had been abandoned and shuttled among five different shelters. She bought Mason, pretrained, from the professional tracker she was training with. In order to track, the dogs sniff an item covered with the missing animal’s scent on it, such as a collar. After that, each dog has his or her own style. Mason is good at scenting in the air. High-energy Dante has the biggest range for running and tracking. Vita is focused, always staying right on the mark. Bella has some combination of them all. Nazarenko and her dogs got their first case before they even got back to Maine from training. Molly, a beagle, was missing in Connecticut. The team tracked her to a condo, where a resident refused to let them in. The next day, someone dropped off Molly at home. Since then they have had 19 other cases, both missing cats and dogs. The team has helped find nearly all of them, sometimes tracking the missing pet to a spot in the woods where it could be drawn out with bait. “You know what dogs love? Cat food,” Nazarenko said. Some searches have been harder than others. Although there have been sightings and the tracking team has scented her, Nazarenko’s dogs haven’t been able to locate Moxie, a Pownal golden retriever-Irish setter mix missing since June. “You don’t know how many golden retrievers there are until you’re looking for one [in particular],” Nazarenko said. For the moment, Nazarenko still works nights as a nurse. She kept her job when she started Lost Pet Tracking Dogs, unsure how popular it would be or how many people could afford her fee, which is a minimum of $150 and varies based on location, travel and search hours. She originally thought she might get one case a month. Instead she has gotten two a day at times. When there’s a case she doesn’t have time to take right away, she advises pet owners about what they can do on their own, like peppering the area with fliers so people in the area will know there’s a pet missing. When she started the business, friends and family called her crazy. Now Nazarenko may, eventually, become a pet detective full time. “The only people who really get it are the people who have dogs. They don’t think it’s crazy at all,” she said.